"This recipe is at least 90 years old, my grandmother says they used it a lot during the depression. Also, you can substitute lemon, almond, or whatever for the vanilla if you're so inclined, but I like vanilla the best. It's also fat free." In a bowl combine the egg whites, corn syrup, and vanilla beat on high speed of an electric mixer for about 6 to 7 minutes. The longer you beat it the stiffer it gets. So if you like a stiff frosting continue beating a little longer. WARNING!!! 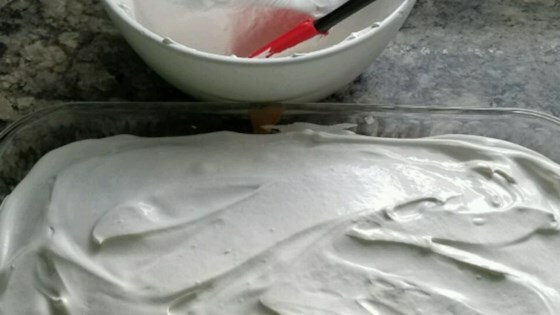 This recipe actually makes marshmallow fluff, NOT vanilla frosting. UGH, this was horrible. Did not even taste like frosting for a cake. Thankfully, I decided to test it before serving it to my family on Thanksgiving. It didn't stay a thick frosting all day and it soked in to my cake. It wasn't over poweringly sweet, which i liked. But it just fizzed out after a while. I really wanted this one to work for me but it just wouldn't get thicker! I ended up beating it for ten minutes and it just did not work for me, it was extremely liquidy. VERY POOR RECIPE!!! IT LIKE LIQUID!!! This was okay if you like marshmallows. But I couldn't really taste it on the cupcakes I made. This is a wonderful, easy recipe to make, and it tastes like dream whip, but it's better!